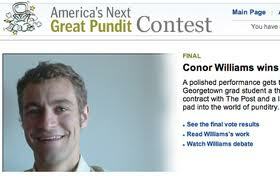 Click here, or on the image, to find out how Conor Williams won the "America's Next Great Pundit Contest." That contest, by the way, was sponsored by The Washington Post, which ought to know about pundits. The Post provides its readers with a full stable of opinion-writing pundits, thirty-four pundits in all, from Achenbach to Zakaria. According to the Merriam Webster dictionary online, a "pundit" is "a person who gives opinions in an authoritative manner, usually through the mass media." Another definition for "pundit" is "a learned man," with my apologies for the sexist construction, which you can find in the original source cited. As someone who provides opinions (right here) on a daily basis, and sometimes in what might be called an "authoritative manner," I might be tempted to think of myself as a "pundit," but I resist this designation. I consider the title pejorative, and here's the reason. I find that "pundits" don't just "give opinions," but that they often, if not always, formulate their "opinions" by way of providing specific advice on what various other persons should do. Usually, the advices given by the pundits are aimed at the President and other elected officials, but not always. The point is that "punditry," as I understand it, is the activity of telling other people what they should do, without having to bear any responsibility for the consequences. That is something different from merely stating "opinions." Thomas Friedman, one of America's "great pundits," is my favorite example. He was a huge cheerleader for the United States' invasion of Iraq, which he was quite certain would advance the causes of peace in the Middle East. Ten of thousands, perhaps even hundreds of thousands of people died. I have never noted any apology on his part. Maybe I missed it. Whether the advice given by pundits is good or not, or right or wrong, I believe that this kind of "advice giving," as opposed to "opinion stating," is where "punditry" goes awry. Perhaps I am revealing my obvious "hang up" with the categorical imperative, but telling other people what to do, instead of doing it yourself, is a kind of abuse of the important right that everyone ought to use, to state opinions, so others can know what we think.